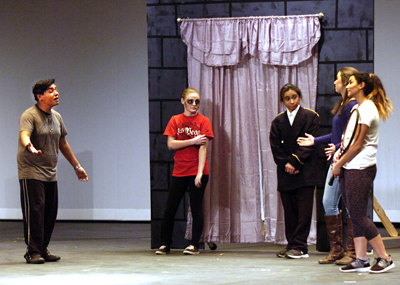 From left, Michael Atole, Dasia Fuller, Robert Kie, Emilee Kennemur and Hayli Aguilar rehearse a tense scene from “The man that did not know that he died” Thursday evening at the Artesia High School Auditorium in preparation for today’s performance. The AHS drama program will present “A Night of One Acts” at 7 p.m. today at the auditorium. Admission is free to the public, and doors open at 6:30 p.m.